Prime Rib vs Ribeye - What is the Difference? Home » Tips & Tricks » Prime Rib vs Ribeye – What is the Difference? Prime rib and ribeye might have similar sounding names, but these two types of meat are not the same at all. The only things they have in common are that both cuts of meat are beef from an area near the animal's ribs. Rib eye and prime rib look, taste, and feel quite different. There are also huge similarities in how you should cook and serve the two products. If you have ever wondered about the differences of prime rib vs ribeye, then keep reading this article. We will tell you all about the differences between these two fantastic cuts of meat. 1 What is Ribeye and Where Does it Come From? 2 What is Prime Rib and Where Does it Come From? 3 Is Prime Rib the Same as Ribeye? Before we jump into the differences and some of the similarities between these two cuts of meat, lets first explain what is prime rib and what is a ribeye cut. What is Ribeye and Where Does it Come From? Ribeye can be referred to in several ways. Some people refer to it as ribeye and some others as rib steak. Even though it has many names, they all refer to the same cut. This cut comes from the rib area of the animal, from the rib roast to be more specific, which includes rib bone. But, to become a ribeye steak, the bone is removed before cooking. So, what is a ribeye? It is a cut of steak from the rib roast, without the bone. What is Prime Rib and Where Does it Come From? The prime rib comes from the same part of the animal as the ribeye; the rib area. Even though they both come from the same section of the animal, they are not the same. Ribeye is cut from the rib roast before it is cooked and prime rib is cut from the rib roast after it is cooked. So, what is prime rib? 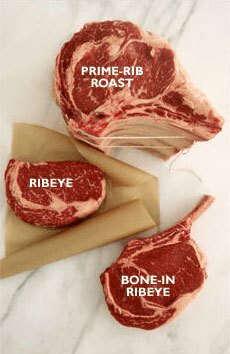 Prime rib steaks are larger cuts than the ribeye because they include the ribeye steak and usually the bone. Is Prime Rib the Same as Ribeye? Both prime rib and rib eye are cut from the rib of a cow. However, prime rib is generally a large cut of beef that contains a large bone, while a rib eye is a smaller steak that is either boneless or only has a small piece of bone. Unlike the prime rib, a rib eye is simply a steak, not a big hunk of meat. It is a cut of steak from the cylindrical muscle near the rib. In some cases, rib eye may be cut from a less prime part of the rib, and it does not have all the fat and muscle of a prime rib. Therefore, the most basic difference between the two cuts is that a prime rib will contain a rib eye, but a rib eye steak does not have all the surrounding meat that makes up a prime rib. Of course a lot of differences in texture are due to the different cooking methods used for these two cuts. We will get to all the differences in cooking later in the article, but right now we are going to examine the more basic textural differences of prime rib vs ribeye. A prime rib consists of a large section of the rib eye, along with bone, and surrounding bits of muscle and fat. All of this fat tends to give it a softer texture. Since it is typically bone in, prime rib can be a little more moist than a ribeye. If a rib eye steak is cut from a less prime portion of the rib than a prime rib roast, it will tend to be a little tougher. This happens because the rib eye can be cut from an area of the cow that was exercised more often. Rib eye and prime rib both have a very pronounced beefy flavor due to their location along the rib. However, prime rib tends to be a little more flavorful than rib eye because it contains the bone and additional fat. All the fat is finely marbled through the rib cap, giving prime rib a buttery sort of flavor. Rib eye is milder than prime rib, but it can still be very flavorful when cooked correctly. This cut of steak tends to have more flavor than a tenderloin but less than a shank. If you are planning on cooking yourself, you might find it a little tricky to get prime rib. Many grocery stores only offer precut rib eye steaks instead of selling large prime ribs. Buyers often have to go to speciality stores or butcher shops to get a nice prime rib. It is a little easier to get prime rib if you are going out to a steakhouse. Most restaurants that specialize in beef will have a prime rib roast menu option. Interestingly, prime rib in restaurants tends to be a little cheaper than rib eye because it is easier for restaurants to cook large cuts of meat instead of doing individual portions. A lot of the differences in prime rib vs ribeye is due to their cooking time and cooking methods. Prime rib is generally cut into a roast, which is cooked at low temperature for long amounts of time, while rib eye is a steak that is normally cooked at medium to high temperatures for short periods of time. Rib eye steaks are a favorite for grilling or pan searing. They do well with higher heat methods that put a nice sear on the outside of the steak. Rib eye steaks do tend to be a little thicker than other types of steak, so they may need a little bit of lower temperature cooking in an oven or sous vide to get the interior to your ideal temperature. The prefered cooking method for prime rib roast is a slow bake in the oven. The bones of the roast are curved to make a sort of natural roasting rack, so people like to put a prime rib in a pan bone side down and roast until done. As you can see, the main difference between prime rib and rib eye is that one is a roast with more muscle and fat while the other is a steak made up of a small portion of the roast. In a few words: Prime Rib is a big roast cut which includes the ribeye, while ribeye is steak cut from the roast, without the bone. Now that you know all about prime rib vs ribeye, it is time to go out and put your knowledge to use. Whether you plan on cooking some beef yourself or ordering at a favorite restaurant, you can be confident that you know all about ribeye and prime rib. Is the shank a good cut of meat? Shank is actually the cut from the leg of the cow. Each cow has the foreshank from the front legs and the hindshank from the back legs. Due to its location in the legs and the constant use of this muscle, this cut tends to be tough and dry with a low amount of marble and fat, so I don’t recommend grilling it. The best cooking method for this method would be braising or cooking for a long period of time in the moist heat. So, is it a good cut? Well, it depends on how are you cooking it. If it is grilling, then this is not a good cut for grills. I hope you now get a better understanding of the shank cut. thanks Kendrick for posting, great stuff to know. Thanks for info on Prime Rib vs Ribeye. Specific and useful.